Xmind is a free open source desktop application with a web-based sharing service. At share.xmind.net you can publish mind maps online. XMind Pro is a subscription option that provides more functionality (for example, storing task information and making Gantt charts) and allows you to make on-line maps private. You can embed online maps in blogs or websites. This is software that I use sometimes, because it produces professional-looking maps and is free. It is therefore flagged as a “Fave”. Wondering about searching all closed maps. 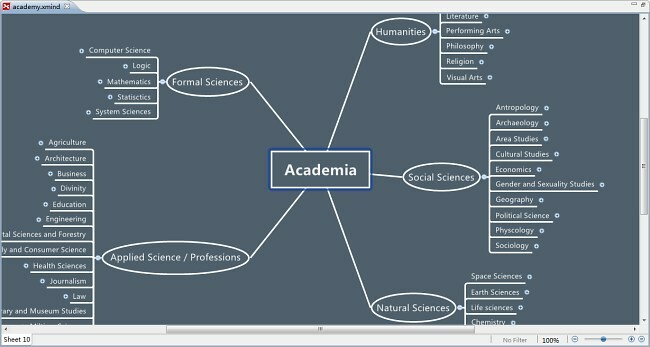 How can this be done for xmind maps (without having them open)? Windows 7 search would be great. Is there a 3rd party solution? 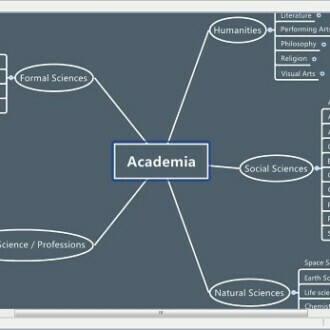 How would I find which mind map apps have this as a feature? I don’t know of one. The problem is that Xmind files are compressed (.zip) files of several XML and other files. One (called content.xml) would contain the targets for your search, but would not be immediately accessible to search software. I sometimes use Notepad++ to search multiple files, but it can’t search a zipped file without the file being decompressed into its components. I don’t know if Windows 7 search can handle this – the search functions in Windows XP does search inside zip files and allows for searching on content, but will only do that if the files have a recognizable compressed file extension like .zip and I suspect Win 7’s search will be the same. I don’t use indexed searches myself because of the overhead it places on all activities, so I’m not sure. You could put this question to the Mindmapper’s Forum to raise the topic related to mind mapping software generally, and on the Xmind Ning to see if anyone there has an idea. Not as powerful as FreeMind, in terms of handling large maps. However, it does have split views, which FreeMind, unfortunately, does not. Free placement of nodes is limited in Xmind, too. Personally I find Xmind superior, but it’s a matter of taste. What do you think about Freeplane, then? You know you can move nodes around more freely if you hold down the Alt key, I suppose?